This was our first full month in our new townhouse! We, um, still aren’t unpacked fully. Apparently we have a lot more stuff than we actually need or use! We are making slow process. The furniture is all set up where we want it except that we need to buy a second bookcase. Our kitchen, bathrooms, and closets are fully functional. We just have a bunch of other stuff in the living area and bedroom we need to put somewhere! We also will have to buy some other storage-type items. Our budget has been thrown so far out of whack this month that I can’t even include a section here that states that there are unchanging portions of our income! I’ll just break it out into all our budget categories. INCOME: We got our yearly cost-of-living raises this month! We now have about $120 in additional take-home pay. SAVINGS and GIVING: Our Roth contributions, targeted savings accounts, and church received the same amount of money as usual this month. With the increased income we received this month, we’ll have to make adjustments next month at least for our tithe and perhaps also Roths. 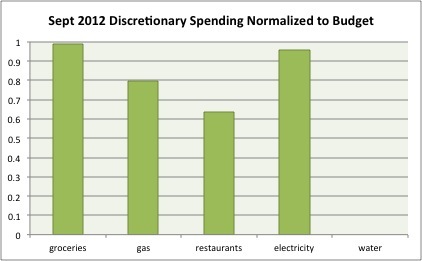 Our non-discretionary spending, normally completely fixed, was nevertheless wonky this month because of our move. Rent: Our rent is now $895, down from $1005. We are taking the excess rent money here and putting it back into savings to refund ourselves for our moving expenses. Cell Phones: My cell is still $35/month. As I washed Kyle’s smartphone a few weeks ago and he suspended his service, we didn’t make a payment to Verizon as usual this month. We actually should receive a bit of a refund from them but haven’t yet – probably we’ll have to inquire. Internet: We are paying $37.49 for internet at our new place, $20 less than before! Groceries: Lots of grocery store runs and several trips to the farmer’s market. We easily could have gone over budget if we hadn’t been keeping an eye on the total, so I guess that’s score one for self-restraint. We are probably going to have to buy groceries by Tuesday though! Restaurants: We went out once after church with our friends, once to our graduate Christian fellowship dinner (only Kyle ate), and I went out to dinner with some girlfriends. We had some other food-centric social engagements but they were potlucks so they came out of the grocery budget. Electricity and Gas: We paid for a full month of electricity in our new place as well as a partial month at our last place and still came in under budget! Our gas bill is due for the first time next month so we’ll be paying for both electricity and gas in this combined category starting in October. Water: We didn’t pay any water bills this month. There should be one for our old apartment but it’s supposed to be paid completely out of our security deposit. Now that this month is over we’re going to contact the complex to see what remains of our deposit. I realized I had a $0.01 balance on my bursar bill at school from a previous semester. Not sure how that happened but I paid it! In three transactions, we spent $27.42 at drugstores on personal care purchases – most of which was while we were in Canada because Kyle had a cold. In total, we spent $818.13 out of our savings accounts and added $163.30 on top of our regular savings to them this month. We applied $43.30 in credit card rewards to this account. We reimbursed ourselves for the balance of our Canada trip from this account for $525.68. I paid for “my half” of our parking permit for $151.50. The bill isn’t due until mid-October so Kyle will probably pay his next month. We paid $5 for parking one evening when we went out to a popular area for a bar crawl. I also went to a discount movie theater with some girlfriends and paid $2. Even though we weren’t able to attend our university’s event to qualify for basketball season tickets, Kyle still wanted to buy the T-shirt for the event for $15 – to complete his set of 6. No spending this month. I refilled our BC for the first time this insurance year and sure enough did not have a co-pay. Now this account will just be for optical and dental care and copays and prescriptions when we are ill.
We made $40 donation to the American Heart Association because our friend’s company was sponsoring a fundraiser. Kyle’s family member who is a missionary put up a request on Facebook for funds to buy toothbrushes for her students so we gave $20. I like having this savings account so we can respond immediately to these kinds of needs. We are using this account to pay for our moving expenses and utilities overages from last month and also to put the savings from the first few months in our new place in to pay ourselves back. I can’t wait until that process is done! We are in need of a major budget overhaul! We received our annual cost-of-living raises this month and are now spending less on rent and utilities. Kyle is in the market for a new cell so as soon as he decides on that the amount we spend in that category will change, too. I’m a bit nervous about distributing all the money to our various budget categories, though, because I think our taxes will go up somewhat through the fiscal cliff so I don’t want to get used to spending that money only to have to remove it in a few months. We do need to put a bit more toward our Cars and Travel savings accounts as they are currently underfunded for our goals. The changes we’re making now for next month are to reduce our Internet budget to $37.49 and increase our tithe by $19. We’ll probably decide on a few more over the course of the month. Bottom line: We had $183.22 left over in our checking account this month (not including our raises – working off last month’s income), which we’ve transferred to our Travel savings account to help pay for Christmas. How was your September? Are you ever able to say “no” to yourself when you reach your budget in a category (we usually don’t)? How long did it take you to settle in financially and physically after your last move? 11 Responses to "September 2012 Month in Review: Money"
Good job on having some extra money despite all of the major changes that you’re going through. Moving is always hectic and it’s never fun (or easy) to go through it; well, other than the fact that it’s kind of cool being in a new place. That’s great that you accomplished your goal! Budgets are so much easier to stick to when they are directly tied to a motivating goal. WOW you guys really are in sync with the budgeting stuff. I wish I had a small account where I could “give” to others charitable causes. Maybe now that wedding season has slowed down I can take that money and apply it to that “category”. Way to go! Well, sharing a Mint account, communicating a lot, sharing a car, and having settled into a very-infrequent spending routine definitely keep us on the same page. We just save a certain amount of money each month into our Charitable Giving account. We don’t make donations every month but I love not having to stress over whether or not we can afford a donation when an opportunity comes up. I recommend just opening a savings account and setting up a small auto-withdrawal like $10 month for a start! It fits in very well with our targeted savings model. Congrats on the raises! I love how detailed your review is. September was great for us, mostly due to a ton of extra income. Extra income is definitely nicer than cutting spending! Congrats on your great month! Reworking the budget because you’re making a little more and spending a little less is a good thing! Every time I get to the end of the month with money leftover, that leftover amount goes to my student loans. So does any additional income other than my day-job salary. It’s great you have a plan for every extra dollar. You know it’s going toward the very best purpose. You’re reserving some side income for taxes though, right?? Wow! That is some seriously in depth budget analysis! That is cool that you guys track it so closely. Our categories are a little broader so we don’t track so closely. Maybe we should. Anyway, I do pretty good at cutting off our budget categories once we have spent the allotted amount. The exceptions are things like milk or bread for the kids! Some things have to be bough, no choice about it – unless you have cheese and vegetables or another alternative!